Connecting a wireless printer to your Linksys router gives you the ease of printing from anywhere in the house. 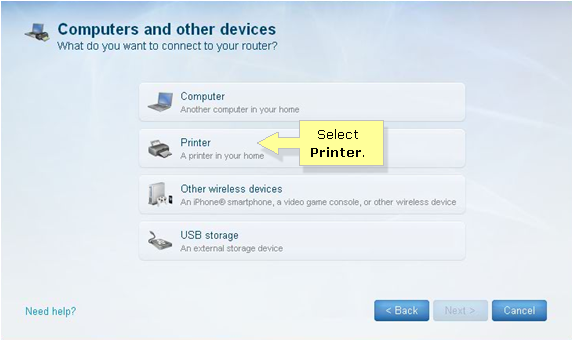 As long as you are connected to the home network, you can conveniently print from your computers’ or devices’ default printing applications. NOTE: This article assumes that you want to connect a wireless printer to your network using Linksys Connect. If you have a USB printer, click here. What do I need to connect my printer to the router? 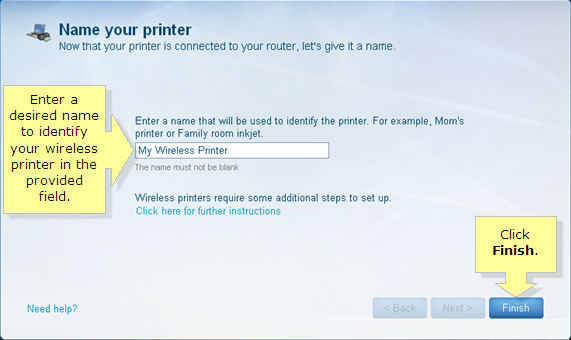 To connect a wireless printer, you need to know your router’s wireless settings. These will be used to synchronize the printer’s network settings with that of your router and create a wireless connection between them. But, if you have Linksys Connect installed on your computer, connecting your printer to the network is just a few steps away. Your wireless printer must support the WPA™/WPA2™ wireless encryption standard. Your Linksys router must be working properly. You have Linksys Connect installed on the computer you're working on. Ensure that your wireless printer is only about 3-10 feet away from the router when setting up the wireless connection. Your printer’s software and drivers should be installed on the computer that you’re working on. Refer to your printer’s documentation for instructions. Launch Linksys Connect. To do this, go to Start > All Programs > Linksys Connect. For Mac® computers, access Go > Applications, and then start Linksys Connect. 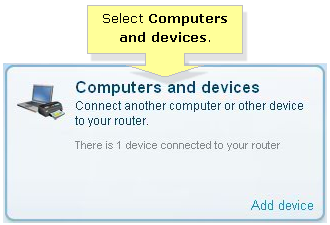 On the main Linksys Connect window, select Computers and devices. In the Computers and other devices screen, select Printer. 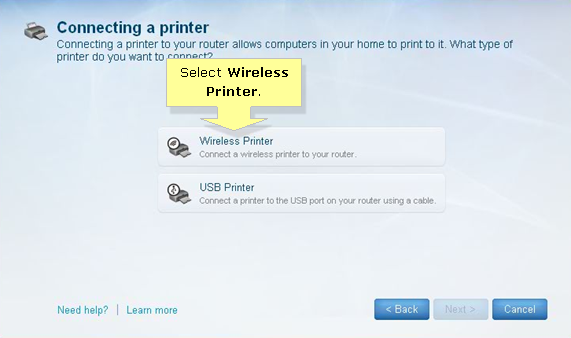 On the Connecting a wireless printer screen, you will find the wireless settings of your router. Take note of these settings and do not close this window yet. 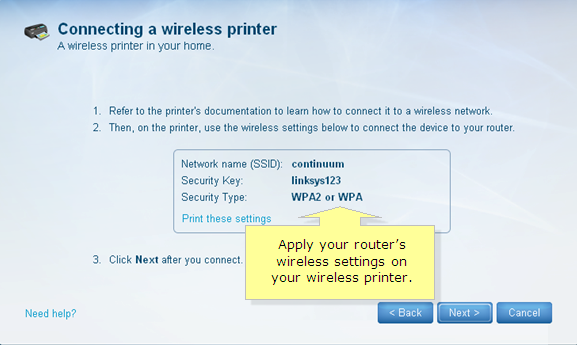 Go to your printer and enter the wireless settings that Linksys Connect displayed on your computer. After entering the wireless details on your printer, click Next on the Linksys Connect window. QUICK TIP: Refer to your wireless printer's documentation or manufacturer’s online support for instructions on how to enter the wireless settings on your printer. To confirm that your wireless printer has been detected, you should be directed to the Name your printer screen. Enter your preferred name in the field provided then click Finish. You should have successfully connected your printer now. To know if your wireless printer is properly connected and installed to the computer, try printing a document. If it doesn’t print the document properly, try following the troubleshooting tips below. 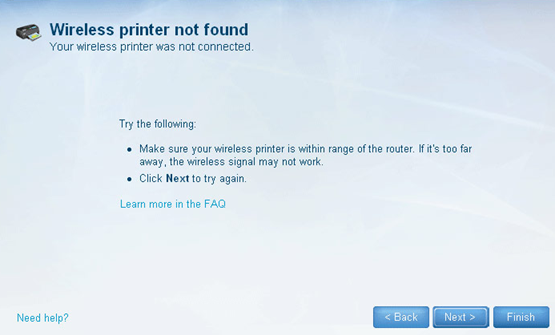 If you get the Wireless printer not found screen, follow the on-screen instructions to resolve the issue. To learn more on how to resolve this error message, click here. Verify that the wireless settings you set on the printer exactly match those on the router. Remove old networks stored on your printer. Check your printer’s manual to learn how to do this. Powercycle the computer, router and printer before going through the setup again. If you are still unable to connect your printer to the network, isolate the problem by connecting other devices or computers. If they connect successfully, there might be other settings that you need to configure on the printer. You may contact your printer’s manufacturer or refer to the documentation for assistance.